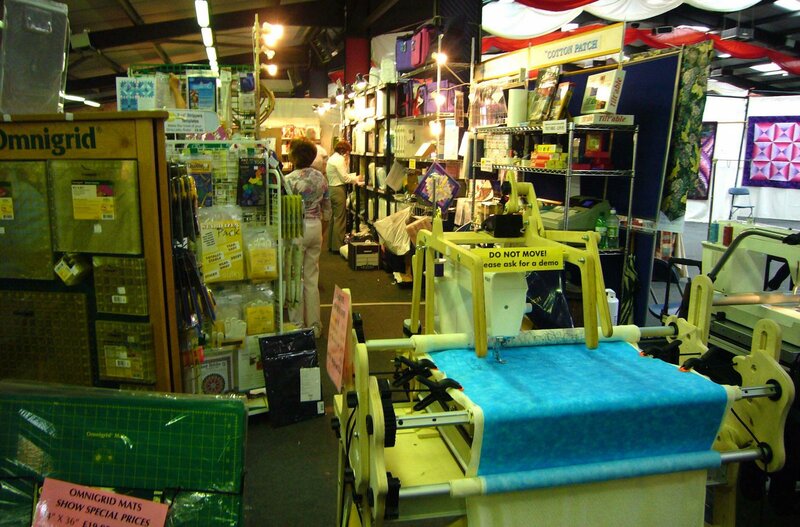 Things were so busy after the Malvern Show that I never found the time to post some of the pictures from the show. As usual it was a great opportunity to meet with our customers - being fairly local to the show its always nice to see some familiar faces and of course for our mail order customers to finally put a face to a name! 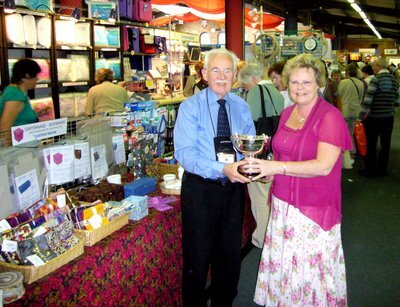 Jane Hopkins, winner of the Large Wallhanging category, received the Cotton Patch Cup - here she is with Geoff Sewell from The Cotton Patch in front of the Cotton Patch stand. 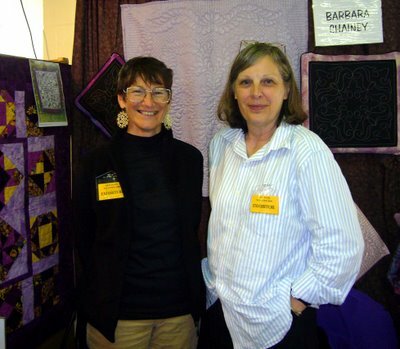 For the past few years we've had the same crew of people working at the show and with a few additional members of staff we'll also be at the Festival of Quilts in August. For those of you who don't know us we are (from left to right). 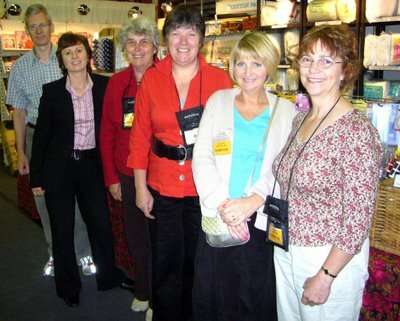 Nik, Liz, Pam, Angela, Denise and Diana. 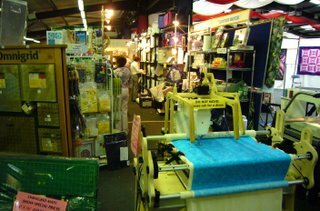 We brought more items than ever before to the Malvern Show (although there are always some things we wished we brought!) 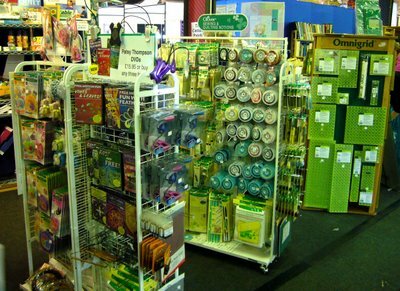 - a very full Omnigrid and Clover stands show just some of the miscellaneous products we had on offer. .. this in the space of seven hours usually involves quite a lot of hard work. 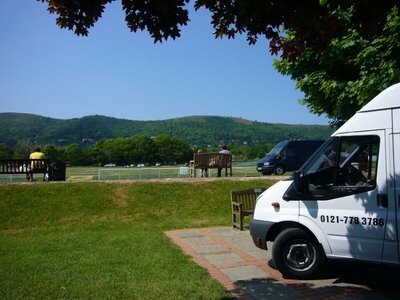 Thanks have to go to all the other staff who help us on setup day - Alan, Adam and David for example (very useful for the heavier items and for driving the vans). Thanks must also go to staff back at base - we top up stock every day and throughout the day call up with a long list of what we need. And of course the mail order has to continue even when we're at the show! At the end of the day we appreciate every single customer who stops by - it makes it all worth while. Plus for Adam, Denise and Alan the lunchbreak on setup day had the bonus of a fabulous view!